Read It and Weep - Jenn McKinlay - review - What is Kimberly reading now? 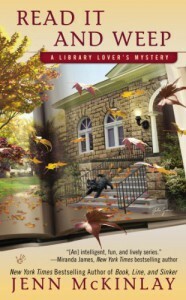 Not much to say about this installment in the Library Lover's Mysteries. Usually I don't care what the outcome of a mystery is; I just want to see how it all happens. The killer was obvious at the beginning of the book. That just made the rest of the book a behind the scenes look at the making of a community theater play. Pythagoras of Samos would be disappointed to know that his theorem has been used in such an obtuse form between Lindsey, Sully and Robbie. There were a few things left open at the end of this book. What's up with Charlene's dad? Is Robbie here to stay? Oh dear, WHY? Will we get more Ian? Does Lindsey's library have the latest addition of Heir to the Jedi by Kevin Hearne? Because I really like Jenn McKinlay and am willing to go along for the ride, I'm going to have to read the next book to find out.